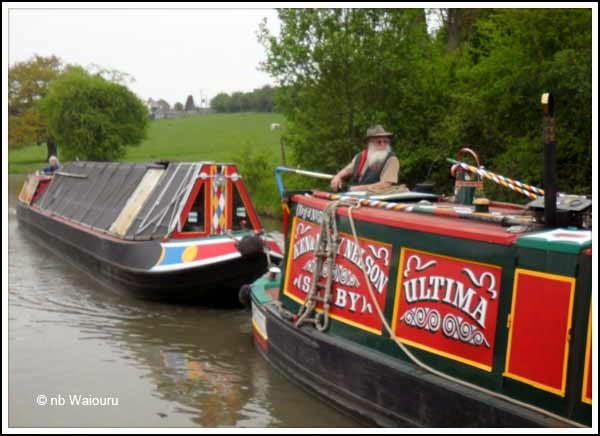 We’re moored just above Hillmorton Top lock with the off-side hatch open enjoying the ambiance. Every so often a boat passes at a speed much greater than ‘tick-over’ bouncing Waiouru around in its wake. Jan has taken to calling out in a loud and friendly voice “Thank You!” Somehow I think the sarcasm is lost on the recipients. 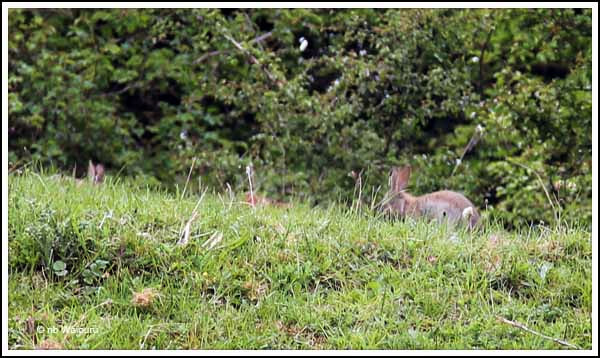 There must be a rabbit burrow on the opposite bank as there are at least six young ones playing in the grass. 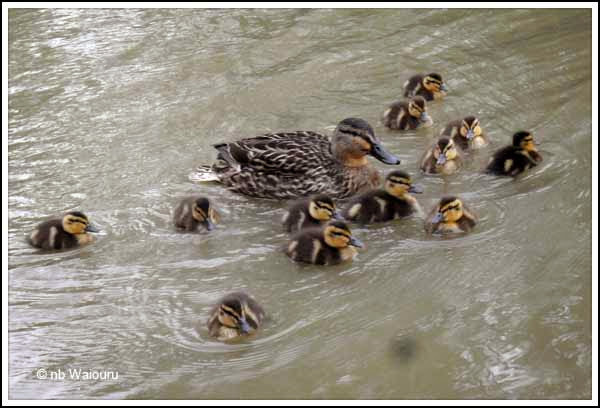 Mrs Duck is also being a good mother as she still has 12 ducklings. All this cooing and sighing……. All I can think of is duck a l’orange and rabbit pie! Problem? Then why the long face! For the second consecutive day I walked back into Rugby. Yesterday was only a dress rehearsal for today’s doctor’s appointment. It went well and I now have a six month supply of my heart medication. The only problem is they now want a sample of my blood. Jan said ”That’s impossible… you haven’t got any!” No doubt our children would say it was cold. Of course I know it’s warm and blue! The BMV600 Battery Monitor has now been working for almost 20 hours. Once the alternator negative lead was connected to the shunt (duh… can’t believe I left it off) and the engine started and the Smartgauge reported the SOC as 55% and the BMV showed 168A flowing into the battery. The theoretical combined output from the two engine alternators is 220A but nothing is 100% efficient. After a short time the BMV reported a steady decline in the amps going into the battery bank. When the Smartgauge reported the SOC as 85% the BMV was reporting the amps as 10-16A. Interestingly, the BMV reported the battery bank SOC as 100% much earlier than the Smartgauge. But the BMV may still be calibrating itself. It was also interesting to watch the BMV reporting the amount of solar power going into the batteries. It was the same figure as the amps shown on the Tracer Solar Controller remote display. A positive sign for the Tracer. My concern about the Smartgauge has always been it reports the battery SOC as a percentage. But a percentage of what? Having the BMV will now enable us to see exactly how much energy is going in and out of the batteries to reach 100% SOC. 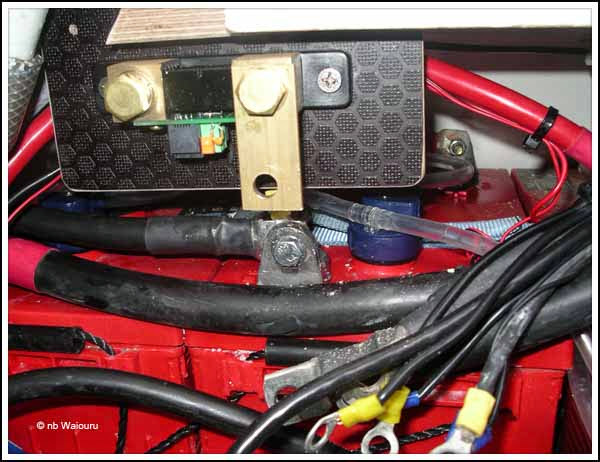 The other advantage of having the BMV is it is possible to identify the critical point where running the boat engine should cease and the charging be completed using the generator. There seems to be little point in running the boat engine to produce a theoretical 220 amps when the batteries can only accept 10 amps! We tried this out today and at 80% SOC (accordingly to the Smartgauge) the batteries were only accepting 16 amps of charge (according to the BMV). So the engine was stopped and the generator started with the remainder of the charge being completed via the shoreline and the Victron inverter/charger. The generator happily ran on ‘tick-over’ for a couple of hours getting the batteries to the final ‘Float’ stage. They are now being maintained there by the output from solar panels. I suspect on a sunny day we will be able to rely on the solar panels rather than have to run the generator. Finally, the BMV is allowing us to see what the energy consumption is for each ‘consumer’. We now know the freezer draws 3.4 amps when it is running. By isolating each piece of 12 volt equipment we should be able to produce a reasonably accurate energy audit and modify our behaviour accordingly. Later….. The BMV is now calibrated and reporting the SOC as 99.4%. The Smartgauge is reporting 100% and doesn’t display decimal places. The BMV is reporting at our present usage rate the battery bank will last 73 hours. All appears to be going well. With little else to do today it seemed like a good idea to make a start on fitting the Victron BMV600 battery monitor. What I should have done instead was sit around and drunk tea! Anyway, the first think to do was collect all the tools and equipment to complete the task. This reduces the number of times the managing director and chief financial controller has to be called to ask for assistance.Note the word ‘reduce’ rather than ‘eliminate’ is used. The shunt for the BMV is connected between the main battery negative terminal and all the negative return cables. So the first task was to remove all the cables and clean the terminal prior to fitting the new ‘connector’ cable. All the negative cables have been removed from the main battery bank negative terminal and the ‘connector’ cable which will be connected to the primary side of the shunt has been fitted. The smaller black cable goes to the Sterling PDAR and doesn’t need to be connected to the secondary side of the shunt. It was at this point I made my mistake erred in my judgement. I forgot to reattach the main negative connector cable from the other battery! The next step was to fit the shunt and mounting bracket. I had just finished struggling to connect the battery connector lead to the secondary side of the shunt (and it was a struggle) when I realised I’d been a “dolt” and the lead had to connect directly to the main negative battery terminal. That meant dismantling everything to fit the cable to the correct terminal. Of course I’d already heavily smeared Vaseline all over the terminals so the remainder of the job was a rather sticky task. 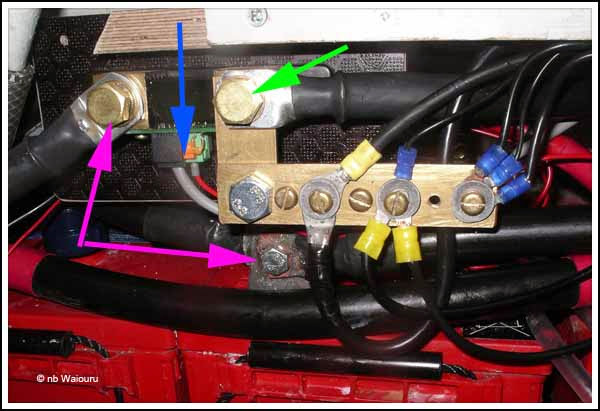 As you can see in the photo above the connector cable between the battery terminal and the shunt is installed (purple arrows). 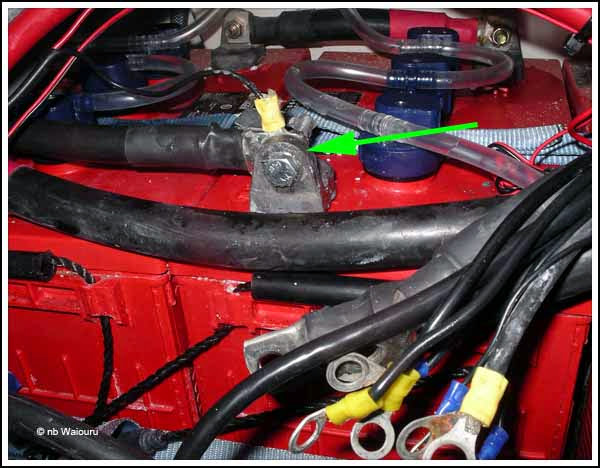 All the negative return cables are now connected to the secondary side of the shunt (green arrow) and the shunt power and data cables have been connected (blue arrow). I don’t have a 2” circular hole saw so the Victron gauge hasn’t been fitted. However it has been connected to the data cable and is giving a reading of 12.72 and 12.75V. There are two outstanding tasks before the installation is complete. The gauge has to be fitted and I need to go back into the engine compartment and secure the data cable with some plastic cable ties. Now all we I need to do is watch how many amps flow in and out of the battery bank! After starting the engine and running it for an hour there was no increase in the battery bank state of charge and the Victron was only reporting amps going out of the batteries with nothing going in! I was sure everything had been correctly reconnected. Back down the engine bay I went like a rabbit down its hole! Cuddling an engine that has the “hots” for you is no longer a delight. There it was…. dangling off to one side….. the negative cable off the main alternator. Must have been a “seniors moment” failing to reconnect it. As usual; it had to be connected to the most difficult of the terminals. Well it’s done now and the Victron initially reported 168 amps flowing into the batteries but that has now settled down to 85 amps. You probably know that over time your toilet bowl, flush mechanism, macerator and pipes (if a pumpout system) will start to acquire a build-up of uric acid and scale. If this isn’t removed the internal diameter of pipes will considerably reduce and you toilet mechanism might fail. Some people put citric acid (eg, lemon juice) down their toilet to dissolve the acid and scale. Others use proprietary products such as Lessan’s De-scaler. The active ingredient of these products is phosphoric acid. Citric juice is approximately 2% phosphoric acid and the Leesan MSDS states the percentage of phosphoric acid is 5-10%. I’m not aware of the price of lemon juice per litre, but the Leesan de-scaler costs £22.72 p/ltr. However Tesco or Sainsbury’s cola is 20% phosphoric acid and costs less than 30p a litre. Guess what we buy to put down the toilet! Once a week a litre goes in the bowl before bed and the toilet is then flushed the following morning. Apparently milk, cheese and meat have even higher levels of phosphoric acid. If you want to feed steak to your toilet then don’t let us stop you! This part will probably be boring for those not interested in the technical stuff. 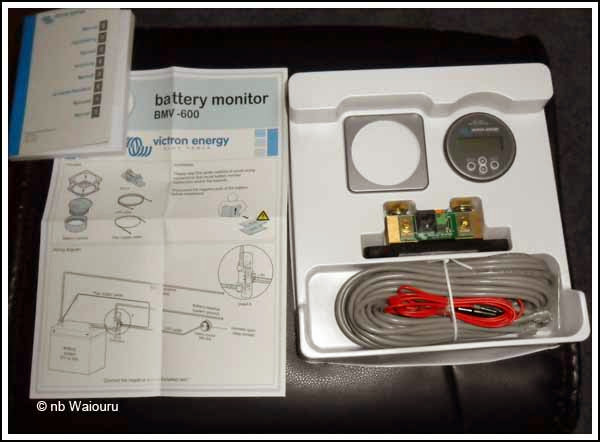 Today I opened the packaging containing the Victron BMV600 battery monitor. Installation actually looks quite simple. The negative cables get removed from the domestic battery bank main negative (-) terminal and are connected to the shunt terminal. A “jumper cable is connected between the battery negative terminal (-) and the other side of the shunt. A small red positive cable is connected between the shunt printed circuit board and the battery positive (+) terminal. 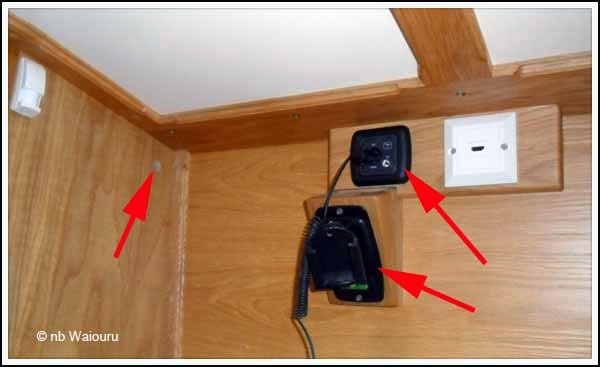 The data cable connects the shunt to the gauge which is located inside the boat. A wooden bracket has been made from Hexipanel offcuts. This will be screwed to the underside of the rear deck immediately above the existing main negative terminal on the battery bank. The shunt will be secured to the bracket with stainless steel screws (no rusting). The 90mm2 black “jumper” cable will connect the battery negative terminal to the correct terminal on the shunt (top left arrow). I’ve made a brass busbar from the remains of the brass strip used for the rear hatch slide. It will connect to the other side of the shunt (top right arrow). 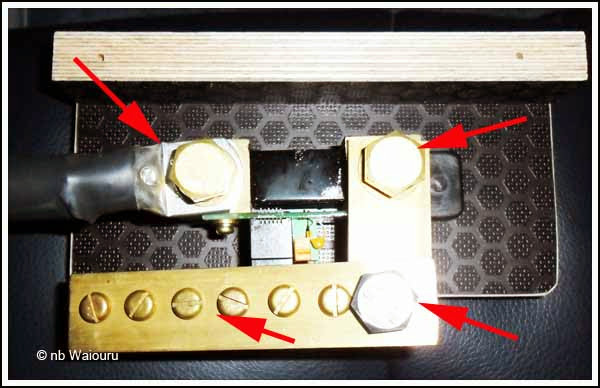 The main negative return cable will connect to the large stainless steel bolt (bottom right arrow) and the smaller brass machine screws will be used to connect all the minor negative terminals to the shunt. Because it was raining I was only able to do a small amount of prefabricating. This is as far as we can go with the battery connections without actually disconnecting the battery wiring. There is no spare room on the instrument panel for the gauge (display) so the plan is to mount it on the side of the electrical cabinet. The initial idea was to move the CE Plate to the right and replace it with the gauge. 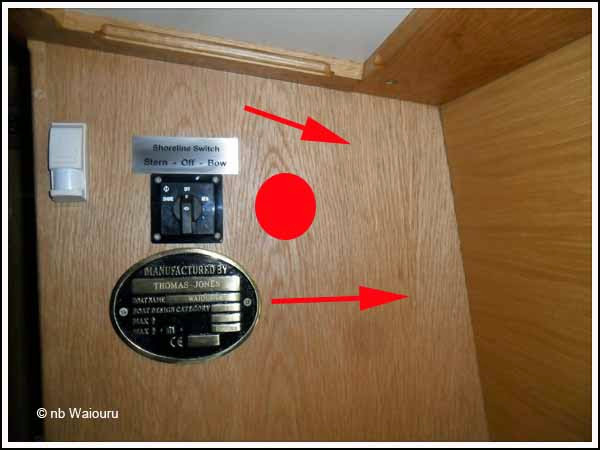 However the galvanic isolator is on the opposite side of the cabinet wall and is wired into the shoreline switch. The gauge can’t go in the top right corner because the solar panel controller is located in that position inside the cabinet. I plan to mount it beside the shoreline switch where the red circle is located. The hole in the cabinet wall needs to be exactly 52mm in diameter for the gauge to snuggly fit. There is a plastic “collar” which screws on to the reverse side of the gauge to secure it. However there is a problem. In the top left picture you can see the gauge with the ivory coloured collar screwed on. 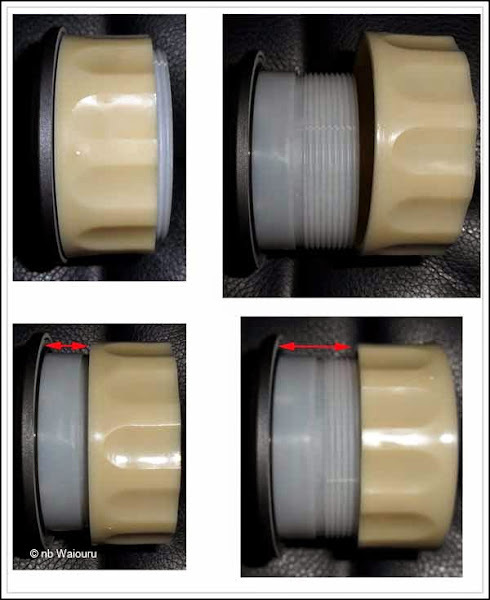 The picture below it shows the maximum depth that the collar will allow the gauge to penetrate. Unscrew the collar any further and it falls off (top right picture) The wall of the existing electrical cabinet is too thick for the collar to screw on to the gauge. Now I understand why there is a square facia panel supplied. Using it allows the gauge to be secured from the front. However I’ve had a clever thought (I hope) and plan to reverse the direction of the ivory coloured collar (bottom right picture). By doing this it gives sufficient depth for the body of the gauge to penetrate the wall of the cabinet. All that is now required is a trip to the 99p Shop or Poundland to find and buy a cheap (one time use) 52mm circular wood hole cutter. 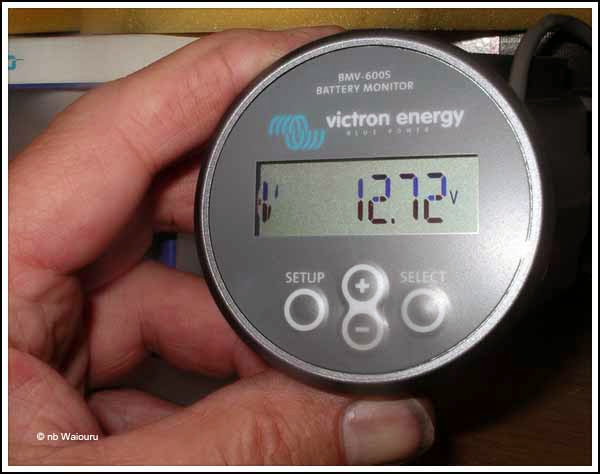 Just looking at the capabilities of the Smartgauge and the Victron BMV600; and assuming they are both accurate; I’d be more inclined to fit the Victron BMV as it does more. However Waiouru is fitted with a Smartbank Advanced system. 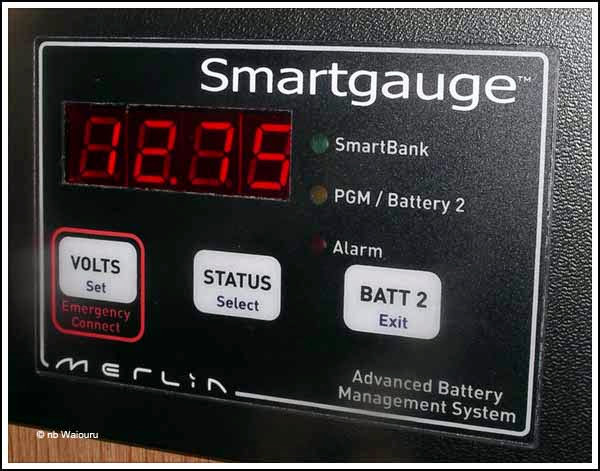 This additional capability means the Smartgauge manages the output from both engine alternators combining them to more quickly charge the domestic battery bank. The Victron doesn’t have this functionality. Yesterday it was first time meetings at the Crick Boat Show and today we had a visitor from Australia. Doug and Tom were in the same class of army cadets back in the mid 70’s. 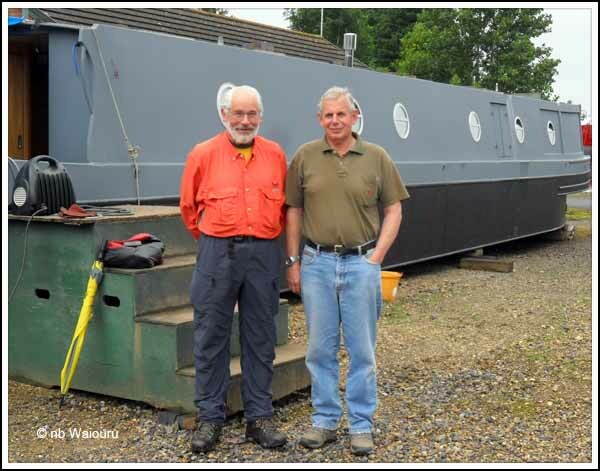 In July last year Doug visited us at Aldermaston Wharf after completing a long trek in Sweden. These long treks are something he regularly does and recently he completed walking the famous Milford Track in the South Island of New Zealand. July 2012 – Doug & Tom in front of Waiouru. We had a text message from Doug confirming his arrival at Rugby railway station on the 10.41 from Euston. It was a 30 minute walk to meet the train and bring Doug back to Waiouru where he promptly presented Jan with a gift brought all the way from Canberra. 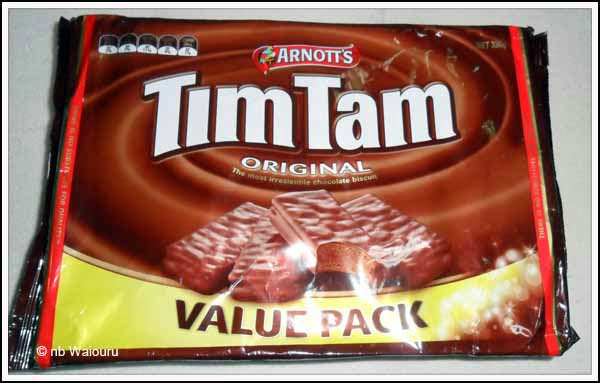 Arnott’s ‘Tim Tam’ chocolate biscuits. An Australian speciality! We’ve had three straight days of lovely weather but today it decided to rain. We gave Doug the choice of staying in Waiouru or going for a short cruise. 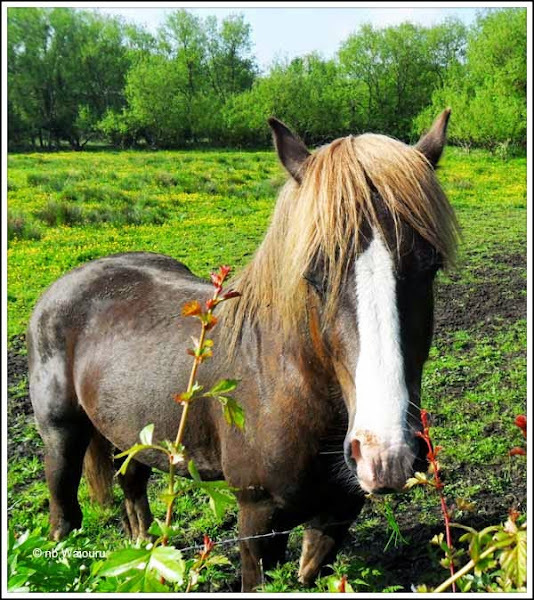 Of course he opted for the latter and so we slipped our lines and headed towards Hillmorton. Doug steered most of the way and did a great job. Especially as it was the first time he’d been on a narrowboat. 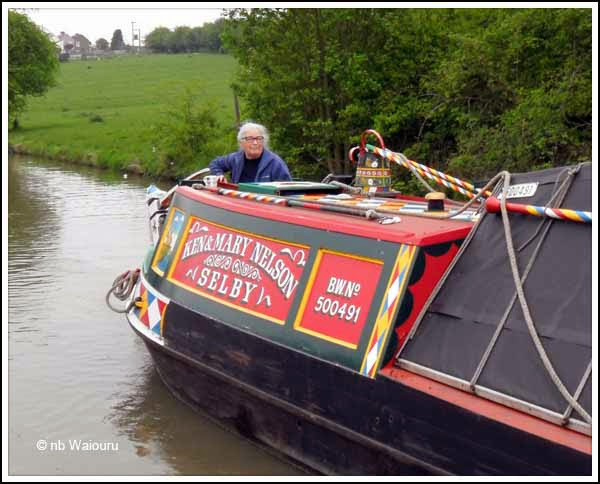 We stopped at the water point below Hillmorton Locks and waited almost 90 minutes for the tank to fill. The water pressure was very low and as a result we gave up before the water level had reached the top of the tank. Doug might be a ‘slow learner’ when it comes to exiting a narrowboat with a closed back hatch cover as he hit his head on it twice. We went up through all three locks with Doug and Jan working the gates and paddles. Another ‘first’ for Doug! At the second lock Doug was told he would be taking Waiouru into the third lock. 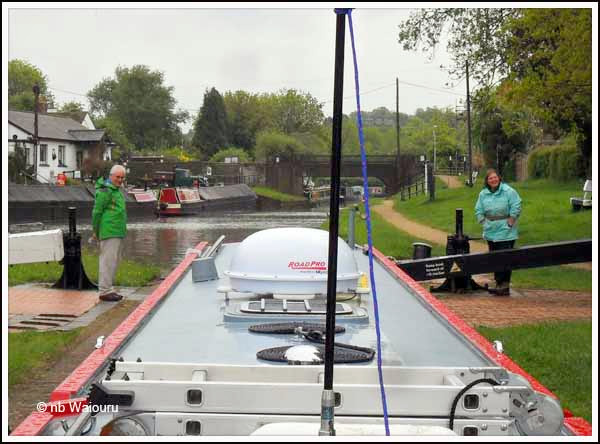 His reply was “Well I’d better start paying attention to how it’s done!” Jan went forward and set up the 3rd lock whilst Doug did a good job of loitering at the entrance. 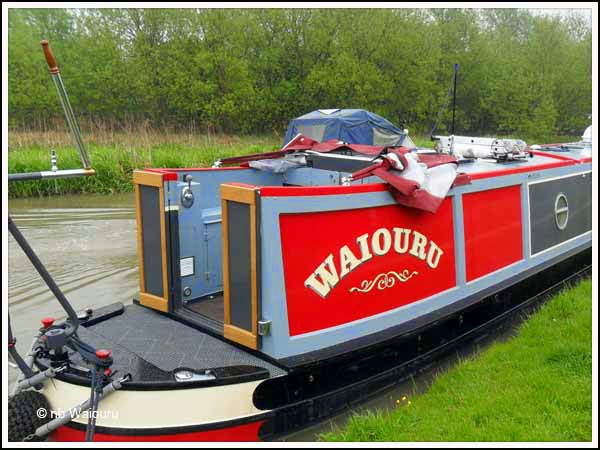 He then took Waiouru into the lock like an expert. Suddenly we realised how much time had elapsed and if Doug didn’t get on his way promptly he’d miss the bus back to Rugby. A couple of hasty goodbyes and he was off. Both of us hope he made his transport connections back to London. 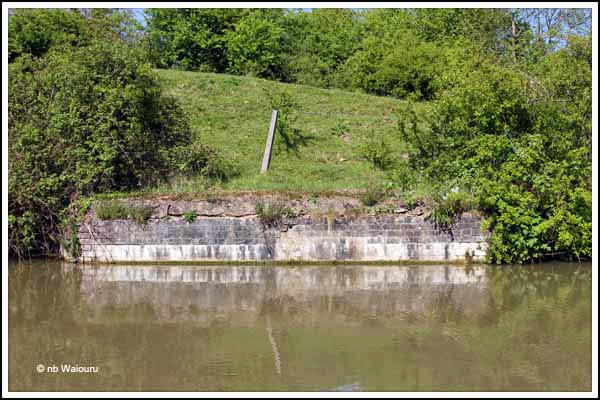 Jan walked ahead to see if there was a mooring above the locks. After some frantic waving on her part we managed to squeeze into a mooring just around the bend. The grass verge has been mowed and we have both a satellite and terrestrial signal. 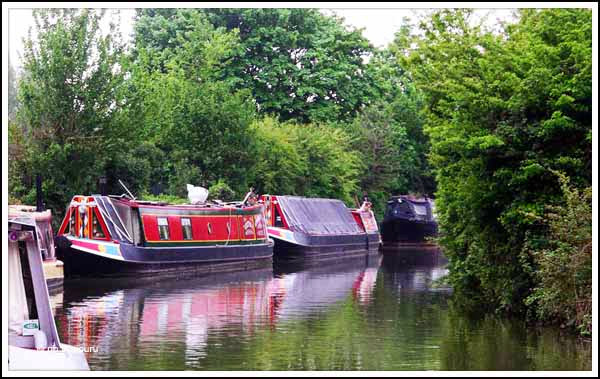 We may stay here tomorrow and let the ‘traffic’ from the boat show clear Braunston junction. But then if the weather is fine it might be a better idea to move! It was such a busy and eventful day that I’m almost too tired to write tonight’s post… Almost! Being frugal Kiwi’s one of the more important tasks completed prior to departing for Crick was to ensure we had a packed lunch as we need to stretch our funds as far as possible. The route to the boat show from our mooring was a short drive in the rental car and we arrived early enough to obtain a parking spot reasonably close to the entry gate. Pre-purchasing out tickets also proved to be a good decision as it enabled us to walk past the long queue waiting at the ticket office. We took a shopping list with us and I was all for getting straight in and buying everything on it as we walked around, however Jan was a calming influence and suggested told me we were going to walk around first and she would price everything on the list. We’d then return and buy at the lowest price! Now you understand why she has control of the family finances. Purchases from left clockwise. A pair of short and long non slip pads which will be shaped and glued onto the gunwale at the cratch and the stern cant. 18m lay flat hose which will be used as an extension should we ever be too far from the water tap. Craftmaster paint to ‘touch-up’ Waiouru’s paintwork. Some ‘Bullet’ carnauba wax for the boat. It was recommended by Dave on nb Leo who is currently moored ahead of us. 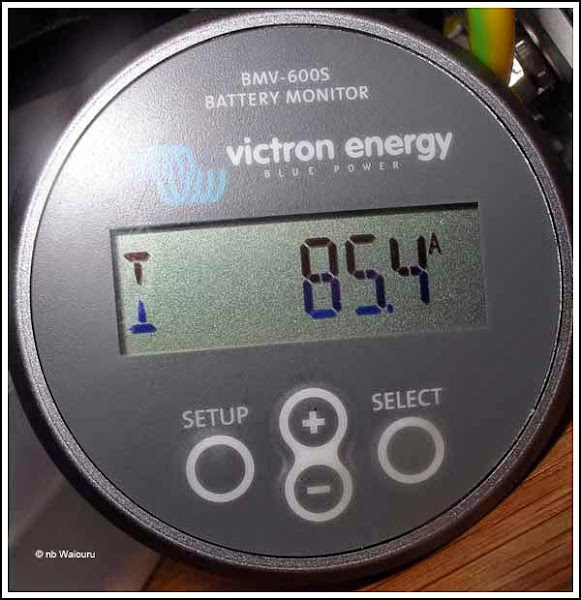 A Victron BMV600 battery management gauge. Two leather boaters “Akubra” style boaters hats. 10 metres of 6mm nylon cordage to be made into replacement fender lines. Two chrome fairleads for the centreline ropes. We started the purchasing at the Battery MegaStore stand where I purchased (and Jan paid) the Victron BMV600 battery management gauge. Whilst we have the Smartgauge I’m not completely convinced it accurately reports the battery state of charge. I think it’s close…. but not 100% accurate. The advantage of the Smartgauge Advanced setup is it combines the output of the two alternators. The BMV600 will also report the battery state of charge as a percentage. However it also reported the amp/hours flowing in and out of the battery bank. I have everything required to fit the BMV600 apart from a circular hole saw. Hopefully the 99p Shop or Poundland will be able to supply one. I’ll probably write a description on the fitting of the gauge in a future post. 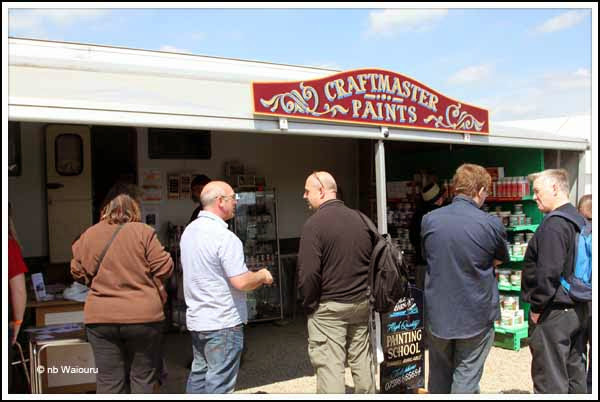 Wandering around the show we came upon the Craftmaster paint stand. It’s now apparentl that having five colours on Waiouru means at least five different cans of touch-up paint. Actually we might need 10 cans as we should consider the need for undercoat. Space is always at a premium aboard so we wanted to buy small cans but also sufficient quantities to meet our estimated needs. The sales lady was very helpful and we managed to get all the paint on our list…. and in the right sized cans. However their card machine had become defective and they could only take cash, which Jan didn’t have. 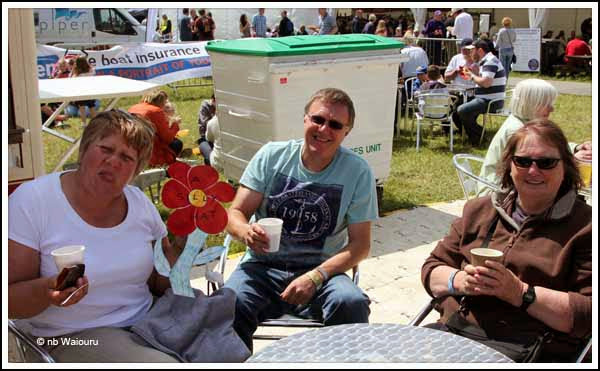 They were able to give us directions to the ATM machines at the show and informed Jan they would discount the paint by the cost of the ATM transaction (£2.95). In the end they gave Jan a greater discount. At a nearby stall cordage was being sold in various lengths, diameters and styles. I happened to noticed a bin containing short lengths of cordage for £5. There was one 10m length of 6mm which looked ideal for replacement fender lines so I snaffled it without further ado. Further along an Irishman from Yorkshire was selling hats and we were each able to buy a leather hat for those days when we either need to keep the rain or sun off our heads. Jan delighted in informing me that her hat is a smaller size than mine. The inference being I have a big head! Of course logic explains this as me having a larger brain! We returned to the Midland Chandlers tent where we purchased the remaining items. Another reason for going to the show was to seek free advice on some of the components fitted in Waiouru. 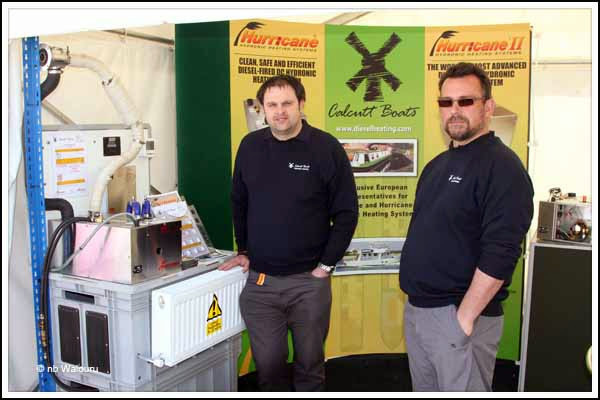 After our earlier concerns with the Hurricane heater we took the opportunity to stop at the Calcutt stand and speak to Steve (their Hurricane expert) about the heater. Not only was Steve able to explain the workings of the Hurricane, he was also able to tell us why the fault might have occurred and how to avoid it. Steve also pointed out the fuel filter in the Hurricane. It’s quite small, which is why I hadn’t seen it previously. The best part of the discussion was Steve explaining in some detail how the wall thermostat worked. We now know how to program the Hurricane so it will only produce hot water rather than heat the interior. This will be a definite advantage during summer! We stopped at the Hempel stand to ask whether it was possible to purchase their epoxy two pack blacking in smaller quantities. Alas, a five litre can is the smallest quantity sold. I explained we didn’t have much room on Waiouru and that their five litre can contained sufficient paint to cover Waiouru twice. All the rep could suggest was we buy the five litre can and then decant it into smaller tins. On a more positive note he advised the two pack blacking has a life of 10-15 years. Apparently it’s the same product that goes onto supertankers and aircraft carriers and they don’t go into dry dock every two years! As most of our ‘collision damage’ is above the waterline I asked if there would be any problem if I rubbed back the affected area to bare steel and repainted it with a primer and ordinary black paint. He though that would be OK.
At the Vetus stand I wanted to know how to do the six monthly lubrication of the water lubricated dripless seal. The rep kindly showed me how it was done on the setup they had on display. He then informed me we could use any silicone grease, before suggesting Wickes as a possible source. I came away much happier! Both of us wanted to go to the Braidbar stand to meet and thank Bruce and Sheila of nb Sanity Again. 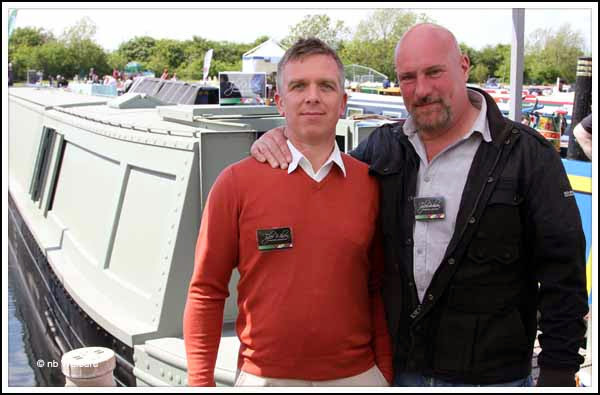 It was Bruce who so kindly sent us an email when we were still in Australia alerting us to a possible problem with Ben Harp Narrow Boat Builders. He also gave us information which enabled us to get in contact with Chris and Allison who were also having problems getting their boat (nb Doo Lalli Alli) built by Ben Harp. That eventually led us to David and Karen of db Trudy Ann. They were ahead of us in the queue of disgruntled owners. Eventually we identified the fourth victim who probably received the worst deal from Ben and Kelly Harp. Unfortunately Sheila was away helping out at another part of the show so we didn’t get to meet her this time. However it was great to meet Bruce and offer our thanks for his early advice. Just around from the Braidbar stand Tyler-Wilson had a sail-away shell on display. We wandered around so Jan could meet Tim. I’d previously met Tim when he very kindly agreed to assist us identify our shell at Ben Harp’s compound in Hixon. Ben Harp had informed our solicitors and the High Court he had already sold our boat and the shell on his compound was for another client. Tim quite willingly gave his time to come and inspect the shell confirming to the police it was the shell that Wilson-Tyler had built for us. Our experience might have been worse if he hadn’t so freely given his time to assist us. Ben Harp’s 4th victim had paid Ben of his Tyler-Wilson shell but Ben Harp kept the money and then went bust! We were very pleased to hear Tim explain that Tyler-Wilson had been able to assist Ben Harp’s 4th victim achieve his dream of having a boat. Tim is a lovely, genuine and honest fellow. As long as this blog exists the Wilson-Tyler logo and link will appear on the front page. We couldn’t leave the show without visiting Paul and Christine Balmer of Waterways Routes. 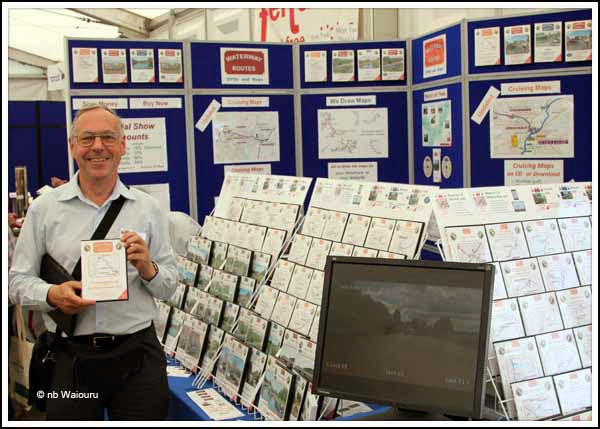 they produce those lovely canal cruising maps on CD or DVD. I had a couple of questions for Paul regarding their maps. Actually our conversation led me to other areas of mapping I hadn’t previously considered. But it’s too much to fit in this post so I’ll have to write about it in a future post. We were standing at the top of the small ridge overlooking the marina when I had a tap on the shoulder and a female voice said “Excuse me!” On turning around I immediately realised I’d be gazumped! 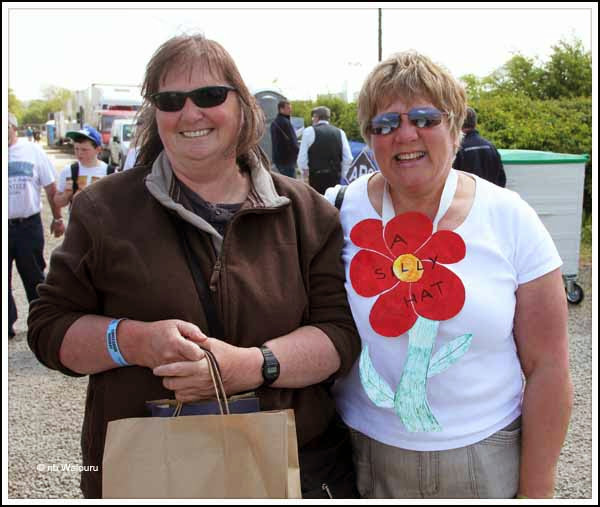 Marian from nb Duxallandyn had previously contacted us to say she would be at the show and we should both wear a silly hat so we’d recognise each other. I’d agreed….. and then grown poultry feathers. However as you can see in the photo…… Marian is made of sterner stuff! 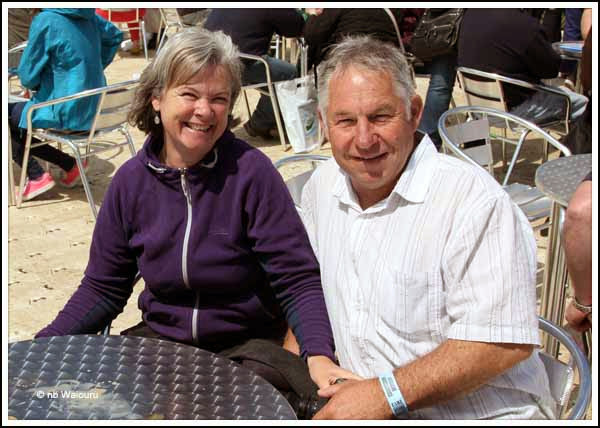 Marian and Mike (her husband) have only recently returned from a six week holiday in Australia, hence the suntan! Part of their time was spent in Perth, Western Australia with their son. My mother and sibblings also live in Perth. What a small world! After a quick conversation we all then retired to the vicinity of the beer tent where we joined Barry and Sandra (nb AreandAre) for one of those all encompassing boaters chats. Sandra and Barry…… Damned Kiwi’s… they’re everywhere these days! One of the last actions for the day was to visit the Waterways World stand and enter the competition where you had to guess the weight of the Vetus engine. My apologies to anyone else who entered the competition. After passing the “Life in the UK” test I’m on a roll and it wouldn’t surprise me if I’d correctly guessed assessed the actual weight to the nearest kilogram. More can be written about the day but that will have to wait until another post. 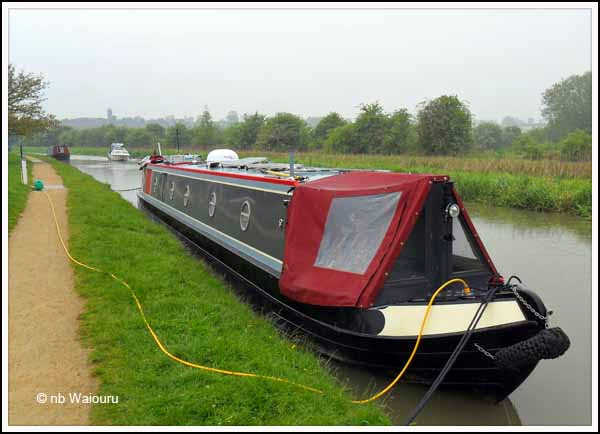 Tomorrow we have an old army colleague of my arriving to spend the day with us and the plan is to commence cruising towards Braunston and on to the GU Leicester branch. Before going any further with today’s post I must first thank blog readers for their comments, emails and phone calls congratulating me on passing the “Life in the UK” test. Whilst your thanks are appreciated I must stress the test wasn’t nearly as difficult as I’d anticipated. Having crammed my memory full of dates, names an events I’d identified as critical in the development of what is now the UK I was somewhat surprised to find few of these questions in the test. We are disappointed to have yesterday missed Angie & Dave (nb Lady Esther) who noticed Waiouru on passing and called in to say hello. Unfortunately we were in Madras Hounslow for the day. 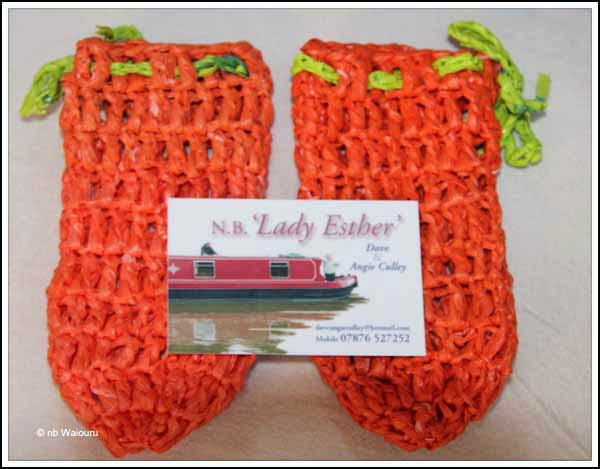 They very kindly left us a pair of mooring pin warmers for those winter nights when your pins start to shiver and work themselves out of the ground. These pin covers have been very cleverly made from recycled Sainsbury’s plastic shopping bags. What a smart idea! Hopefully we will catch up with Dave and Angie at some future date and can discover the method of making the covers. We are on a lovely mooring with interesting views on either side. Out the starboard side hatch is the golf course. 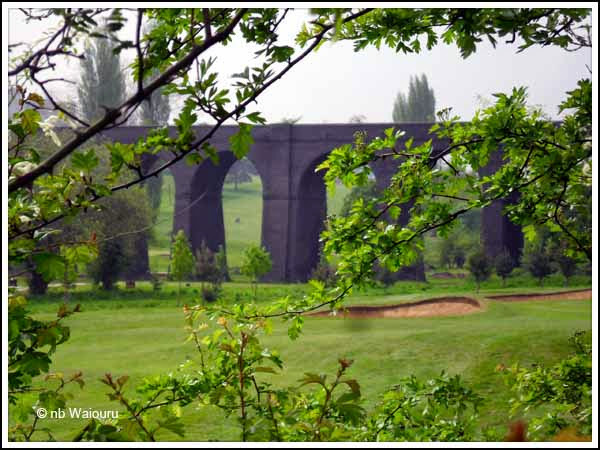 The brick arch bridge bisects the golf course and runs towards our mooring. Out the port side hatch is this view. It looks slightly boring until you realise the brickwork is the abutment remains of that high arched bridge in the earlier photo. So we are moored directly underneath the bridge… which is no longer there! The bridge was part of the now abandoned Rugby and Stamford Railway. Jan has been watching the local fauna above the bridge abutment. One morning she could see squirrels out looking for nuts on the grass ridge. 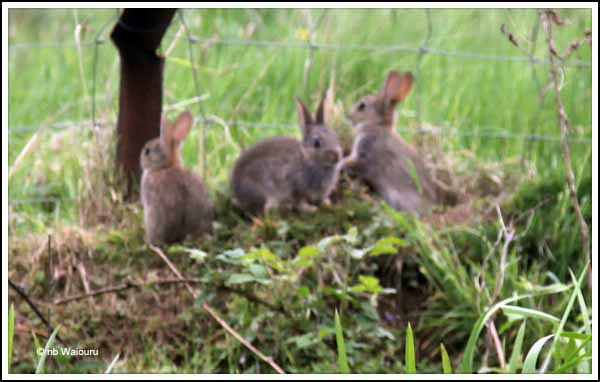 I actually thought they were rabbits. But next time I looked out the window I could see the nuts…… so perhaps she was right! It’s been a very relaxing day. First it was my usual Sunday morning phone call to dear old mum back in Perth, Western Australia. Next I did some painting (badly) whilst Jan baked a loaf of bread for lunch. The smell of freshly baked bread got to me and I had to eat at 11.30am. The taste of a tomato sandwich using fresh warm bread is mouth watering! We then used the rental car to do some shopping from Tesco before returning to Waiouru where I cleaned and polished the paintwork in the cockpit and cratch. Jan got all twitchy and wanted to do some laundry but eventually she calmed down and the urge faded. For two consecutive days it has been warm and sunny. That’s a ‘first’ for 2013. The solar panels have kept up with the demand on the battery bank from the fridge, freezer, and various small appliances requiring recharging. One of which was the hair clippers which Jan subsequently used to shear me. It’s the third consecutive haircut she has given me so the clippers have now paid for themself. Apparently there were a couple of “oops” moments during the operation but I can’t see around the back so it doesn’t worry me. Anyway, the difference between a good and bad haircut is……. two weeks! Tomorrow we’re off to the Crick Boat Show and the forecast isn’t nearly as good. Our luck! It was a 5.00am start to the day, even at that time it was light. We ate a light breakfast anticipating the drive and full day ahead. The car from Enterprise had been collected yesterday evening and parked reasonably close to the canal in a quiet area. Last night the car gps had been programmed with the location of the nearest car park to our destination and we had pre-packed our day bags. Although my appointment was at 1.30pm we left early allowing time for possible delays en-route. The destination was Hounslow, near Heathrow and the gps calculated it would take 1¾ hours. The route was fairly straightforward going down the M1 onto the M25 and then briefly east on the M4 before hitting the suburbs. Allowing additional time for delays proved to be a good judgement call as there had been a major incident on the M25 with a caravan rolling over and blocking two south bound lanes of traffic. By the time we reached our destination Jan’s legs and eyes were crossed. We hobbled down to the High Street looking (unsuccessfully) for public conveniences. Nothing in the Bus Station and then we saw ASDA. Unfortunately nothing in there either. Then I noticed in the distance the “Golden Arches” who always have customer toilets. Jan wasn’t convinced, but in the end I was right as usual. First impressions of Hounslow were “We’re in Little India!” The sights, smells, shops and people all evoked memories of our time in Serangoon, Singapore. It became a case of “Spot Wally”? All the Europeans appeared to be Polish. I’m not sure if they are moving into the area taking over from the Indians or the Indians are moving the Poles out? However, it appeared WE were “Wally”! Jan can remember her grandmother taking her to the shops in Hounslow and it looked nothing like it does today! Now wanting to risk a problem with the lower half of the elementary canal on our return journey we elected to play it safe and eat in the Golden Arches. Their food may be tasteless cardboard…. but at least you can be sure it will be consistently tasteless cardboard and the standard of hygiene is usually high. Looking at the patrons I noticed the Indians tucking into the Big Mac’s and chips. “Hey….. don’t you guys know the beef patties are made from cows!” Then I noticed the guys in their “Dishdasha’s” also eating the Big Mac’s. “Guys…. the beef patties in your Big Mac’s are not Halal!” Hang on….. remember I’m the Wally here! At 1.30pm we were taken to the adjacent room where there were computer terminals. The conditions under which the test would be conducted were explained and we were required to turn off our mobile phones. One of the lady’s told us if we needed to hear the test questions rather than read then on the screen we must use the supplied headphones. She explained some people had previously been caught using ‘bluetooth’ headphones connected to their mobile phones to obtain answers to the questions. From all the questioning of my identity it would appear there have been numerous attempts to have someone else sit the test on behalf of the applicant. It consists of 24 questions taken from a list of 401. Each person has a different set of questions so it’s not good sneaking a look at your neighbours screen. One hour is allowed to complete the test. In order to successfully pass the test 18 of the 24 questions must be answered correctly. It took me six minutes to answer the 24 questions. I’d probably have been quicker but two questions had me stumped momentarily lost for an answer. The first related to women in employment. In the UK, do approximately ¼ of women make up the workforce OR is it approximately ½ of all women? The second question I know I got wrong. The Turner prize is awarded for, Literature, Contemporary Art, Art, Theatre, Film. Don’t know the answer? Neither did I… and guessed wrong! Only last week I wrote a blog post about Sir Frank Whittle and the jet engine. One of the questions was “What did Frank Whittle invent?”. Another easy question was “The Six Nations Tournament involves which sport?”. After finishing the test I was taken back downstairs to yet another office where I again handed over my passport and was again questioned to confirm I was the owner of the passport. Then I was informed I had passed the test and a certificate was issued to me. I was informed the original of the certificate would have to be submitted to the UKBA along with my visa application and that I must not lose the certificate as a replacement wouldn’t be provided. If it was “lost” I’d have to re-sit the test (plus pay another £50). I now have a “Life in the United Kingdom Handbook” for sale. Usual price is £12, but this one is going for £20 as all the answers have been marked! A five minute walk back the the car park to be reunited with Jan (briefly contemplated leaving her in Mumbai) and then we were on our way back north. Four hours of car travel to spend six minutes in front of a computer screen. All up cost of the test was £140 (booking & travel). Next task is to start collating all the remaining supporting documents for my visa application which has to be submitted in July. Looking out the porthole and watching boaters going past all wrapped up and looking miserable can give one a smug and warm feeling! Thank goodness we aren’t in the unfortunate position of having to move in this weather. I was intending to go outside today and tend to a few chores around Waiouru. Sensibly I lay down and waited for the feelings to go away! It looks as if there must be some type of direct relationship between the weather and the speed boats travel. When it’s terrible weather the majority of boats seem to be passing at a faster than usual speed. Probably because they are anxious to be somewhere else! The bread had gone stale but rather than let Jan feed it to the ducks I was prepared to eat it even if it was crunchy. However Jan had other ideas and cut the loaf into slices which were covered with cheese and sliced ham before being grilled in the oven. The ducks are now giving me the evil eye! 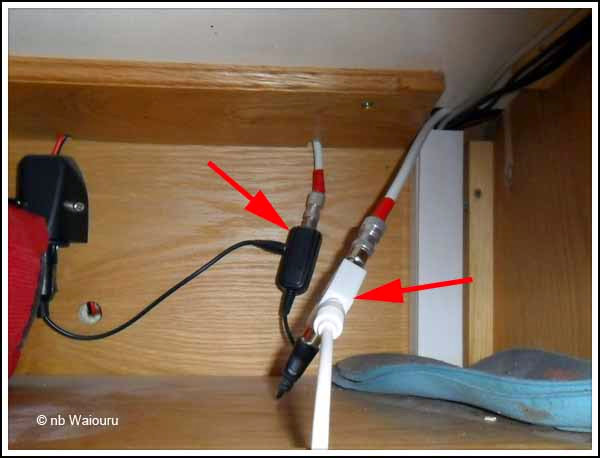 After a process of trial and elimination the problem with the terrestrial TV signal has been identified as the coaxial cable that runs between the main TV cabinet and the small TV on the bedroom wall. I think the bedroom end has become ‘kinked’ and damaged. The most obvious solution is to pull out the wire and replace it. However I have identified another solution. If we had been living in the UK for a decade or two I’d probably have a good set of tools at home which I could use to implement the second option. 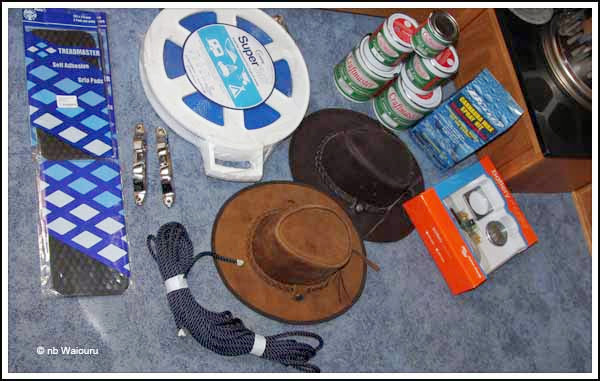 But of course Waiouru is our home and the only tools I have are a small collection for maintaining the boat. Time to put my hand in Jan’s purse! I need a wood bit capable of drilling a 15mm hole in the wall of the adjacent bedroom wardrobe. 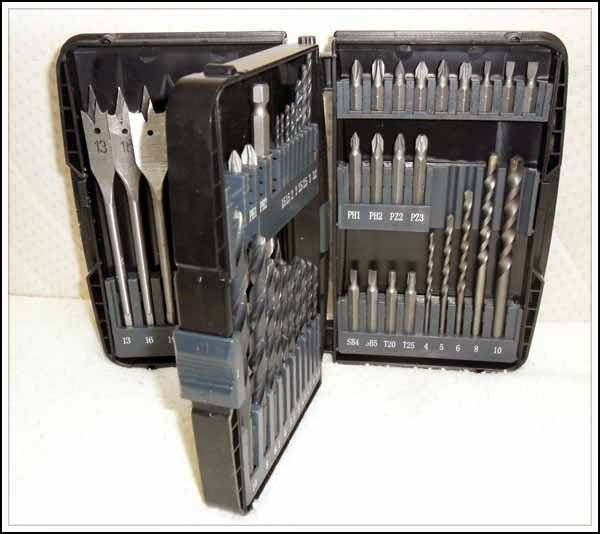 A Google search revealed Wickes currently have a special deal on a 51 piece drill bit set. Whilst I only need one bit this deal is very good value for money. At the price I’m not expecting them to be high quality tradesman’s bits, but then they will probably be used very infrequently. So in the morning it was yet another walk back to the local Wickes in Rugby (in the rain with the brolly attempting to invert itself) where I found (to my relief) they had several sets still in stock. The plan involved drilling a new hole through the wardrobe wall so a coaxial lead can be run from the TV into the top of the wardrobe where the TV aerial amplified is located. The original TV socket is in the black wall socket (top right arrow) which is immediately above the TV wall bracket (bottom arrow). The white flush plate is the HDMI outlet socket which links the TV to the Network Media Tank in the Saloon. 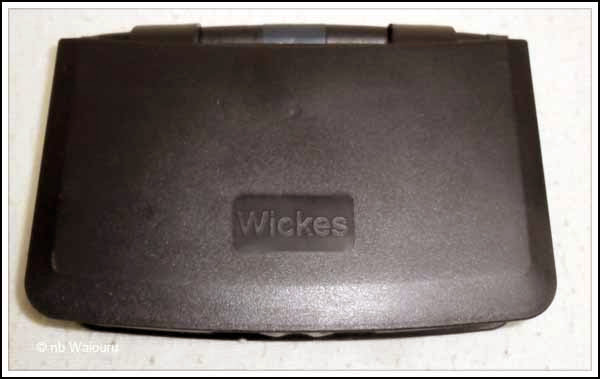 The small white device in the top left of the above photo is one of the IR detectors connected to the monitored silent burglar alarm. The top left arrow points to the 15mm hole I’ve drilled into the top of the wardrobe. The left arrow points to the TV aerial 12v signal amplifier and the white cable out the top of the amplifier goes to the aerial on the roof. The amplifier feeds out to a temporary two-way splitter. The white cable goes through the ceiling to the main TV and media player. The bottom white cable goes to the TV in the bedroom. It now runs through the new hole in the wall which can just be seen in the top right corner of the above photo. Now all this has been tested and proved to work I need to tidy up the wiring. I’ve also been thinking of fitting a flush mounted TV coaxial wall socket on the outside of the wardrobe. A short TV lead would then link the socket to the TV. However I’m mindful that every joint adversely affects the quality of the TV signal and I might buy a blank plate. Then I could drill a hole in the middle of it exactly the same diameter as the coaxial cable. The would conceal the hole in the wardrobe without creating yet another joint in the cable. 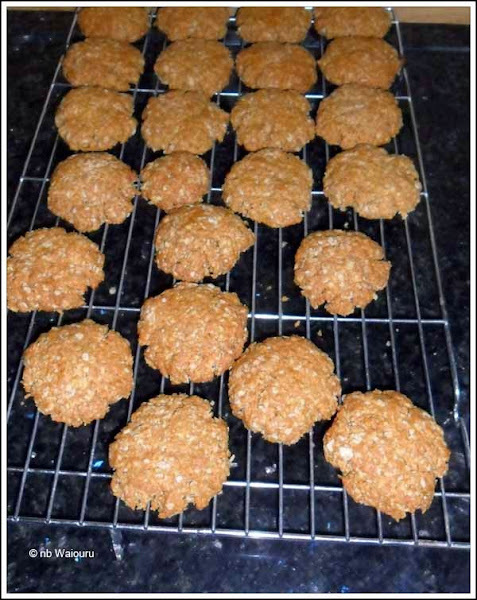 Meanwhile Jan has been baking ANZAC biscuits. Delicious smells have been wafting through the cabin and I’ve been forced by my stomach to stop work and partake! After sitting inside all day I now need to whip up the enthusiasm to walk the two miles to Enterprise to collect the car for the weekend. I know….. I could ask to be collected! But I’m being somewhat cheeky collecting it late today when it has been booked for tomorrow morning. Besides…. I’ll also be able to check if my skin is still waterproof. Another walk into Rugby this morning. We could have taken the bus but the exercise will be good for us. 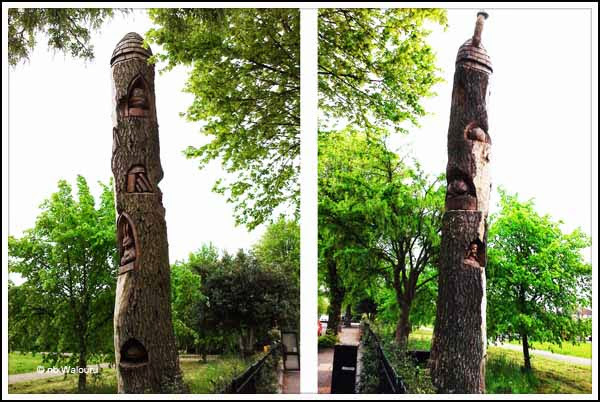 On our way along Clifton Road we noticed a tree on the far side which looked as if it had died and the trunk had then been carved with various figurines. 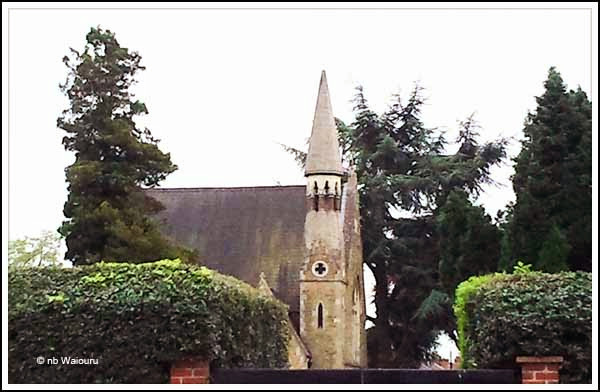 Even further along the road was a slightly unusually shaped church behind a high hedge. It was the round shape of the steeple that particularly caught my eye. It’s the Orthodox Church of the Ascension and St Chad. According to the church website “Parishioners are from various backgrounds including British, Greek, Ukrainian, Romanian, Russian, Latvian, Coptic, Byelorussian, Serbian and Bulgarian. Services are held in English, with some parts (e.g. the Lord’s Prayer) additionally recited in other languages”. The church is located in the grounds of the Clifton Road Cemetery. There is a memorial to the English poet Rupert Brooke (born locally) in the cemetery, although he is actually buried on the Greek Island of Skyros. He died there in 1915 of sepsis from an infected mosquito bite whilst on his way to the Gallipoli landings. But the business had failed and was closed…….. Is there a message in that? Nay! The medical practice was quite easily found, but then we had the rigmarole of filling out the various local and NHS forms. What is the British obsession about alcohol consumption? Almost 50% of the pages related to the amount and frequency of alcohol consumption. Having briefly tasted some of the local stuff I can’t understand why anyone would willingly drink it! Jan didn’t have any issues with the processing of the application forms because she was able to declare her place of birth as the UK. It took slightly longer for the foreigner! We now have to wait five days before we can make an appointment to see a doctor and get a prescription. However that fits in nicely with our current cruising plans. It was only a short walk to ASDA where Jan purchased a loaf of bread for lunch and some beef steak for dinner. The latter looked nice, but proved to be very tough. Jan had a tender piece but most of mine had to be left on my plate. I had thought of saving it to resole my walking boots but by the time I thought of this Jan had disposed of it. In the late afternoon a boat and butty quietly cruised passed Waiouru before mooring around the corner. I wonder if I could grow a beard like that?